The Presence of IT Single Touch Payroll (STP) Reconciliation Tool is a complete bolt on solution to assist in the reconciliation business process and to dramatically improve on the existing PeopleSoft delivered reports. A staggering three percent of an employer’s workforce in the USA is absent on any given day. This is equivalent to 2.8 days per worker lost due to sickness or injury in 2017 (US Bureau of Labor Statistics, 2017). The cost of absence is often misunderstood, it is seen as not easily measured or dismissed as a negligible amount because the costs are largely included in payroll expenses. However, according to the US Bureau of Labor Statistics, 2017 this equates to nearly $74 billion in costs due to employee paid absences. The high price of absenteeism affects organizations even more when lost productivity, morale and temporary labor costs are considered. In addition, employers often fail to carefully track absenteeism. In the past two years, more U.S. businesses appear to be making leave administration a higher priority. They are putting new practices in place or refining existing processes to boost workforce productivity and, perhaps more importantly, to ensure compliance with federal, state, and local laws. The Guardian Absence Management Activity Index℠ seems to indicate the companies are placing greater emphasis on their leave administration practices now more so than ever (The 2017 Guardian Absence Management Activity IndexSM and Study). Often, businesses have no way to track and understand the reasons employees miss work. We know that about two-thirds of absences are due to illness, stress or job dissatisfaction, but without insight into the exact reasons, it’s difficult to tackle the underlying problems and turn the trend around. In response to some of the PeopleSoft customer requirements and changes to employer practices, Presence of IT in 2010 created a bolt-on dashboard (Team Calendar) to provide greater transparency of absences between management and staff for our PeopleSoft HCM users. 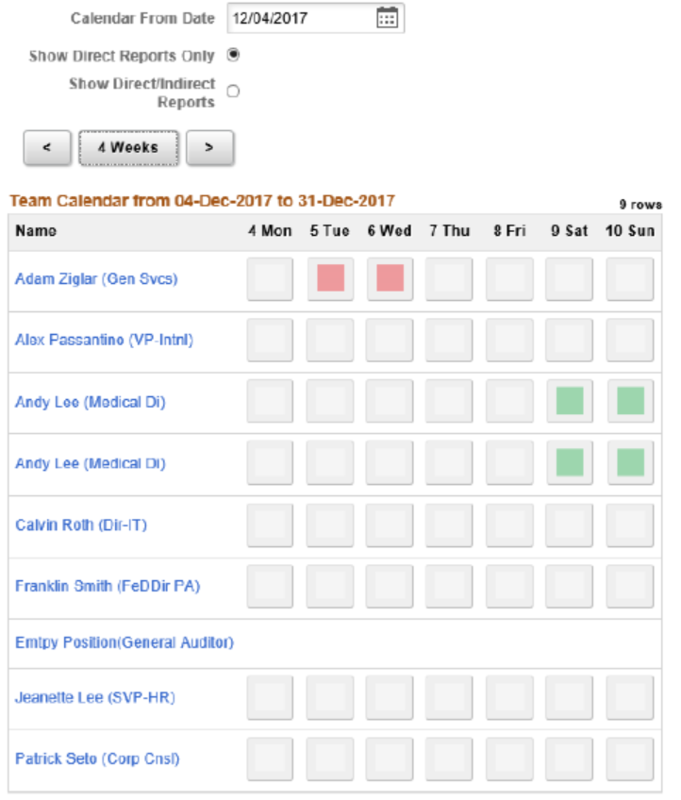 The Team Calendar is an intuitive information dashboard that is designed to display both approved and pending leave in a single place. This includes all absence types, such as Training, PTO, Sick, Jury, Holidays etc. in addition to displaying the employees’ roster details. What needs to be displayed on the Team Calendar is entirely configurable and it is based on existing Absences and Employee Schedule configuration in PeopleSoft HCM. The data displayed will provide the necessary information for decision making by HR Policy owners and management. Compelling evidence supports quantifying and tracking absenteeism that has an impact on your direct bottom line such as salary, benefits and replacement workers in addition to indirect impact caused by reduced morale, which cuts productivity. By carefully planning and designing solutions, managing absenteeism and its administration, and tackling the underlying causes (e.g., health issues, employee morale), an organization can significantly reduce the impact of employee absences on its bottom line. Presence of IT's Chamanthi Weerasinghe had the good fortune of attending Alliance’18 Conference in Salt Lake City recently. Presence of IT has been sponsoring this great event for 13 continuous years.